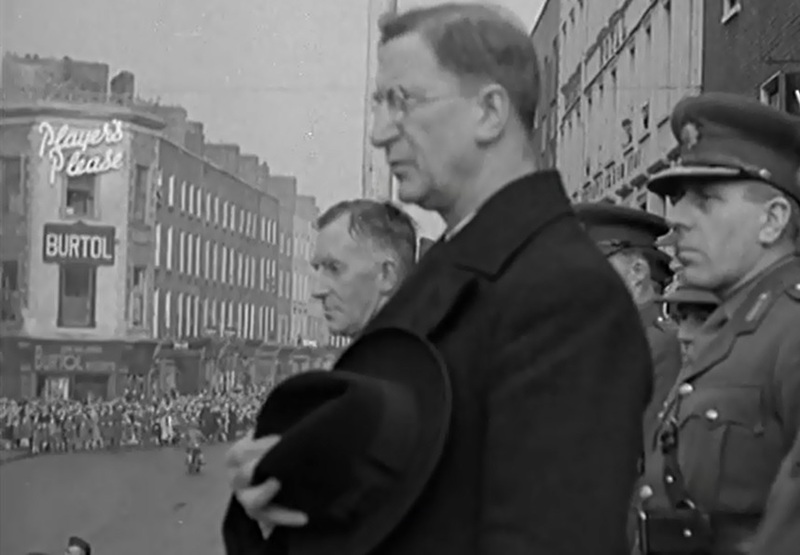 In 1941, Eamon De Valera, the then Taoiseach of Ireland a position he held from 29 December 1937 to 18 February 1948 paid a visit to Limerick. This visited was filmed by the British Pathe and would have been played in cinemas throughout Ireland and England. It shows a parade which included armed personnel and nurses on O’Connell Street. Eamon de Valera, Taoiseach and President of Ireland he was born in Manhattan, New York, on 14 October 1882, to an Irish mother. His father died when he was two years old and he was sent to Ireland to be reared by his maternal grandmother, Elizabeth Coll in Bruree, Co. Limerick. He retired from office in 1973 and died in Dublin two years later on 29 August 1975, at the age of ninety-two. He was buried in Glasnevin Cemetery after a large state funeral.